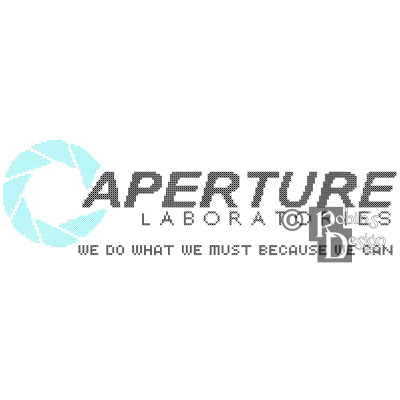 Aperture science, we do what we must because we can. The company behind GLaDOS and the portal gun.This pattern was hand designed by a professional artist/crafts personFinished size is approximately 14.5 wide x 4.5" high when worked on 14 count fabric (202 x 64 stitches) The image is composed of 2 colors. THIS IS NOT A KIT.Each pattern contains..
Atlas and P-body appear in the two player mode of Portal 2 to aid GLaDOS. This pattern was hand designed by a professional artist/crafts person Finished size is approximately 10.5 wide x 11 high when worked on 14 count fabric (145 x 150 stitches) The image is composed of 37 colors. This is NOT a kit. Each pattern con.. 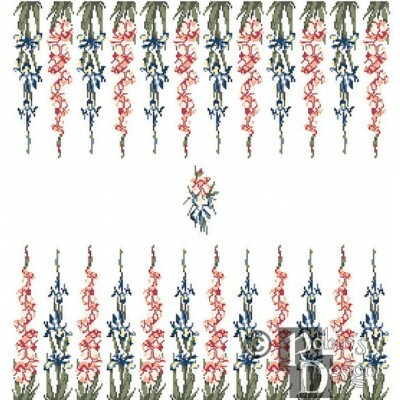 This beautiful backgammon board has stalks of pink gladiolus and iris for the points. The bar in the center is a spray of the same flowers. This piece will play nicely with stones from most backgammon sets.This pattern was hand designed by a professional artist/crafts personFinished size is approxim.. 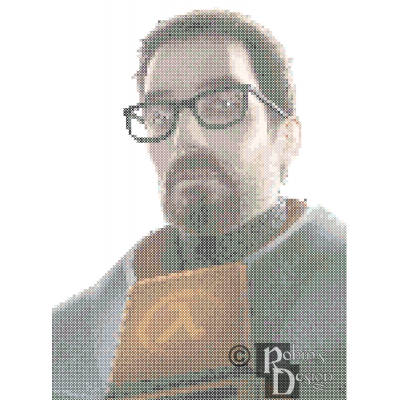 I know he looks like Hugh Laurie, but this is Dr. Gordon Freeman the hero of the Half Life game series. This pattern was hand designed by a professional artist/crafts person Finished size is approximately 8" wide x 11" high when worked on 14 count fabric (111 x 151 stitches) The image is composed of 38 colors. This is NOT a kit.&nbs..
Made you lose!!! 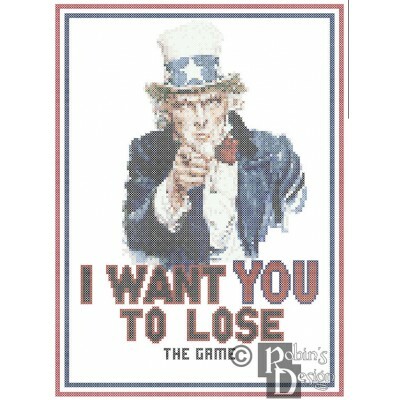 Dang it, made myself lose too!This pattern features the iconic image of a pointing Uncle Sam with the caption, "I want you to lose the game." This is a great way to foil all those people who are playing, just don't look at it yourself, lest you too become a loser.This pattern was ..
A fun spoof of the Keep Calm and Carry On poster produced by the British Ministry of Information in 1939. Instead of the normal crown, there are three tiles (dragon, wind and bamboo)The pattern can be stitched on colored fabric or the background can be sewn. Please specify if you want the pattern w..
A fun spoof of the Keep Calm and Carry On poster produced by the British Ministry of Information in 1939. Instead of the normal crown, there are three tiles (dragon, wind and bamboo)The pattern can be stitched on colored fabric or the background can be sewn. Please specify if you want the pattern wi.. 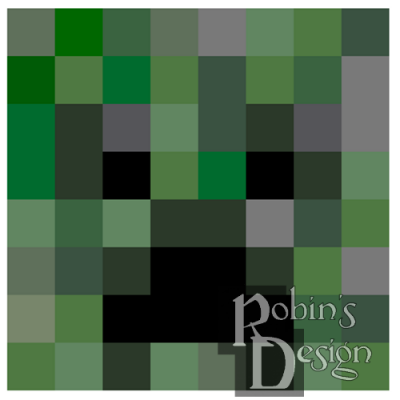 The creeper is one of the cutest (and most explosive) mobs in the addictive game, Minecraft. This is an accurate depiction of his head scaled down to be sewn on a shirt breast using waste canvas or aida. You will get a set of four faces in four sizes. 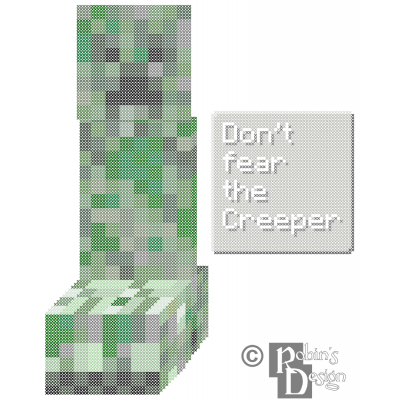 It is a great blending of Minecraft and needlecraft!These patterns were hand designed b..
Don't fear the creeper, just run away. This is an accurate depiction of the ever explosive creeper from the addictive sandbox building game Minecraft. It is a great blending of Minecraft and needlecraft!This pattern was hand designed by a professional artist/crafts personFinished size is approximately 8" wide x 10" high when worked on 14 co.. 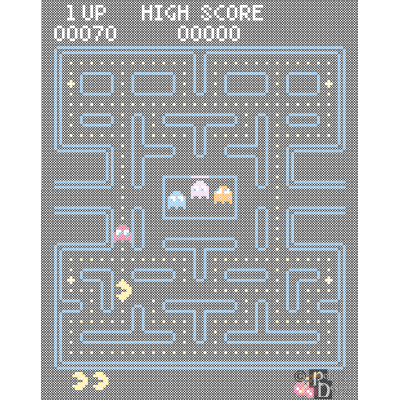 This is an accurate depiction of the game screen of the classic video game Pacman. This is a fairly easy pattern and can be worked on black fabric or the black background can be stitched. 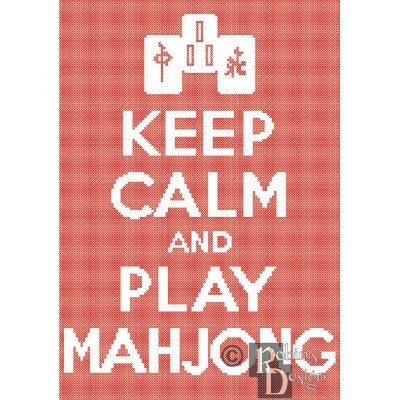 Specify if you want the pattern with background stitches included or without background stitches when ordering. This pattern was hand designed by a p..
"The Enrichment Center is required to remind you that you will be baked, and then there will be cake. "Here is the often promised cake from the game Portal. 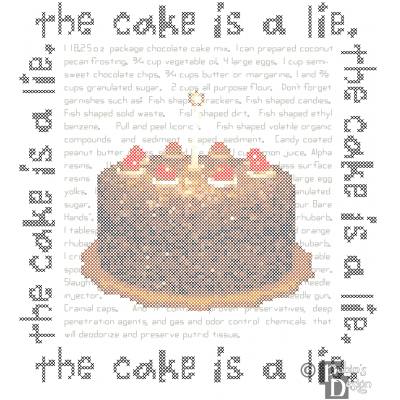 The background shows the "recipe" recited by GLaDOS's cake mix core. This pattern may be stitched without the recipe background, but wouldn't you like to see all the fish shaped garnis.. 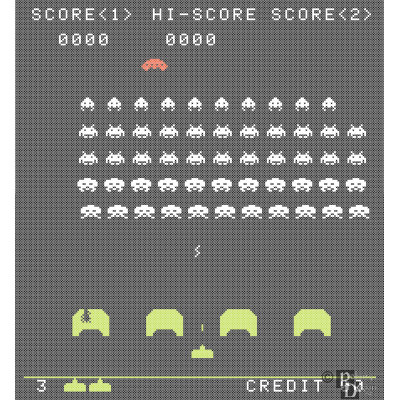 This is an accurate depiction of the game screen of the classic video game Space Invaders. This is a fairly easy pattern and can be worked on black fabric or the black background can be stitched. 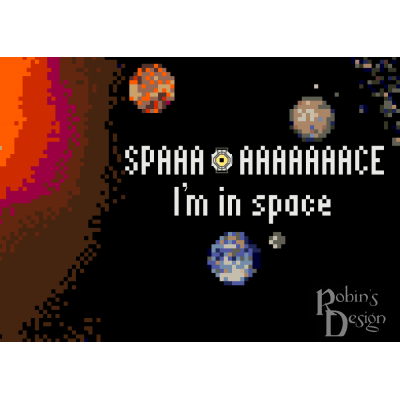 Specify if you want the pattern with background stitches included or without background stitches when ordering. This pattern was hand designe.. The Space Core from Portal 2 in the solar system. He is close to the Earth and our moon, Venus, Mars and its moons, and the Sun (what will he say to the sun? "Hi"). This can be worked on black aida, or for the more ambitious, the background can be stitched.This pattern was hand designed by a professional artist/crafts personFinished siz.. The Space Core from Portal 2 in the solar system. He is on his way to visit all of the planets of our solar system as well as Pluto and the Sun (what will he say to the sun? "Hi"). 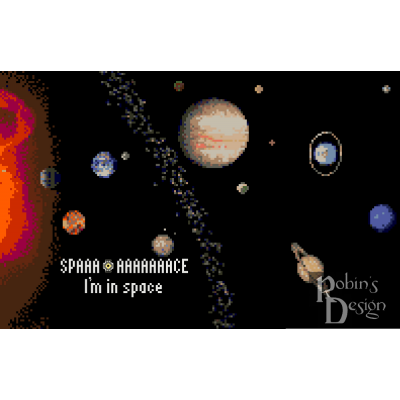 He can also visit Mars' moons, the Galilean moons of Jupiter and the asteroid belt. 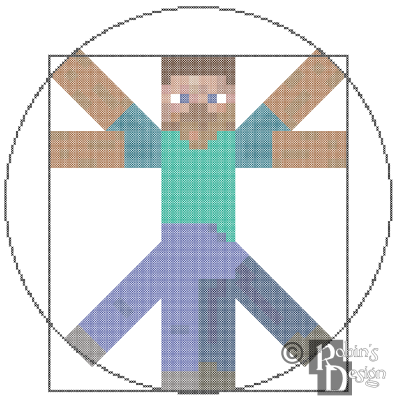 This can be worked on black aida, or for the more ambitious, the backgroun..
Steve, the generic player character from Minecraft, in the pose of Leonardo da Vinci's famous drawing "Vitruvian Man".This pattern was hand designed by a professional artist/crafts personFinished size is approximately 12" wide x 12" high when worked on 14 count fabric (168 x 168 stitches) The image is composed of 23 colors. THIS IS NOT A KIT.Ea..